Lock in a great price for NH Barcelona Stadium – rated 8.3 by recent guests! Comfortable hotel for short stay in Barcelona. If you come to watch to Barcelona FC then it’s the best location in the city. Everything worked and the staff all spoke good English. The staff was friendly and accommodating. Breakfast was fair, but not spectacular in choices. Very close to the Stadium, they prepared us a box lunch because we have to leave very early in the morning and gave it to us at 4:30am!!! Very welcoming staff. Comfortable bed and beautiful room. 1) next to the camp-nou stadium. 2) many taxi around the hotel. 3) many restaurants and supermarkets around the hotel. 4) close to the train station. 5) excellent breakfast. The room was bigger than I expected as was the general size of the room! Really lovely hotel - I would stay here again! NH Barcelona Stadium This rating is a reflection of how the property compares to the industry standard when it comes to price, facilities and services available. It's based on a self-evaluation by the property. Use this rating to help choose your stay! Overlooking Camp Nou Stadium and Diagonal Avenue, the modern NH Barcelona Stadium offers free WiFi, a gym and seasonal rooftop pool. The air-conditioned rooms have flat-screen satellite TV, mini-bar and a pillow menu. NH Barcelona Stadium Hotel’s seasonal sun terrace offers wonderful views across Barcelona to Montjuic. It also has sun loungers. The hotel’s restaurant, Acanto, offers a varied buffet breakfast, as well as an á la carte lunch menu. The lobby café is open until midnight every day. The restaurant is closed during summer months. Les Corts Metro Station is just 5 minutes’ walk away and offers a direct link to Barcelona’s historic center. Diagonal Avenue can be reached in 10 minutes on foot, and Sants Station is 0.9 mi away. Barcelona's Fira Congress Center is a 10-minute drive from the hotel. 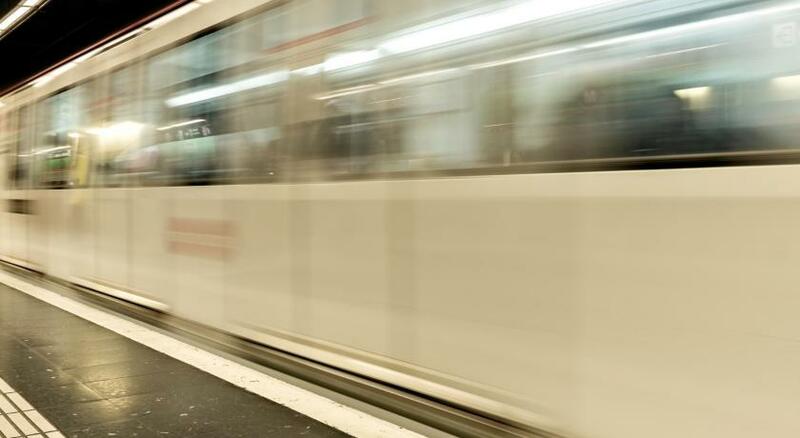 Barcelona El Prat Airport can also be reached in 10 minutes by car. When would you like to stay at NH Barcelona Stadium? 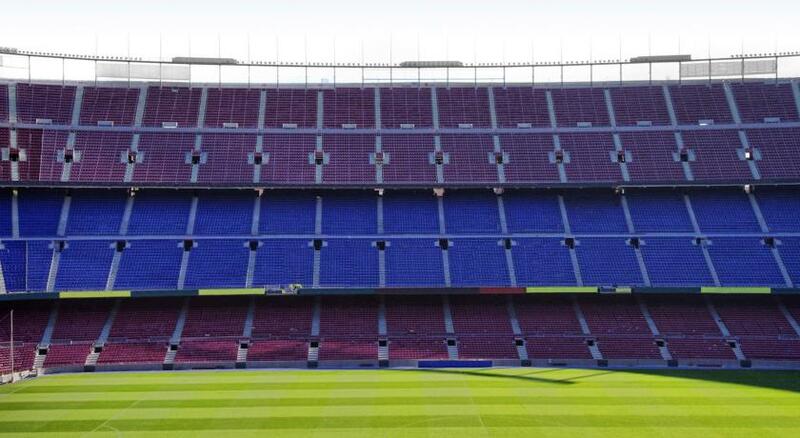 Offering views of FC Barcelona's Camp Nou Stadium, these air-conditioned rooms include flat-screen satellite TV, a mini-bar and a pillow menu. The private bathroom comes with a hairdryer and free toiletries. Some of the rooms have a bathroom that is adapted for guests with reduced mobility, and some rooms have a balcony. Some of the rooms have a bathroom that is adapted for guests with reduced mobility, and some have a balcony. Some of the rooms have a balcony. These modern, air-conditioned rooms either overlook the inner courtyard or have a balcony or views of FC Barcelona's Camp Nou Stadium. They include a coffee machine, kettle and mini-bar, as well as flat-screen satellite TV. The private bathroom includes bathrobes, slippers, a hairdryer and free toiletries. 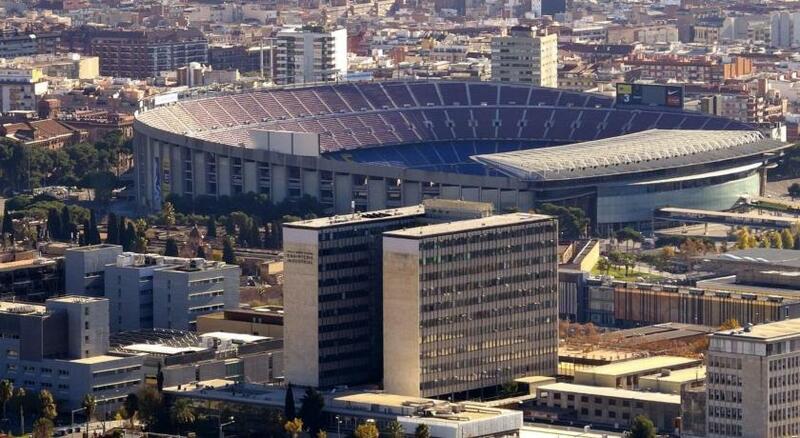 Our hotel is the nearest hotel to FC Barcelona’s stadium. If you’ve come to see exciting football, there’s no better place to stay. In the summer months you can use our rooftop swimming pool. House Rules NH Barcelona Stadium takes special requests – add in the next step! NH Barcelona Stadium accepts these cards and reserves the right to temporarily hold an amount prior to arrival. Please note that the outdoor pool, terrace and sun deck are seasonal. Hotel restaurant food was overpriced and had limited choices but there are several inexpensive restaurants nearby. miss simple things such as no cattle no tea no water,isnt worth the money we paid. Very clean and close to the Stadium, Camp Nou perfectly convenient for attending a game. Staff was extremely friendly and helpful. Beds were comfy as well! There is nothing that I didn't like. Fantastic location if you are coming for FC Barcelona game. The hotel was very kind and fulfilled my request for a room with the FC Barcelona Stadium view. My single room as a good size, not too small and not too tight. Very friendly and helpful staff. Room was dark and staff not very warm. friendly staff, great location for the football ground. Breakast very nice and even have a food corner for child . Super market and bus stop is just next to the hotel . Nou camp is like 200 meters by walking. Very nice big room as I go to watch Barcaaaaaaaaa!!!!!!! Restaurant in the hotel was bit pricey. There are plenty of inexpensive restaurants next door.